All of the cane I use is imported "Tonkin" bamboo from China. Arundaria amabilis grows on mountainous hillside slopes whipped by winds that, over their growing cycle, give it the stength that builders have come to rely upon. After being cut it is stacked and dried in the sun. 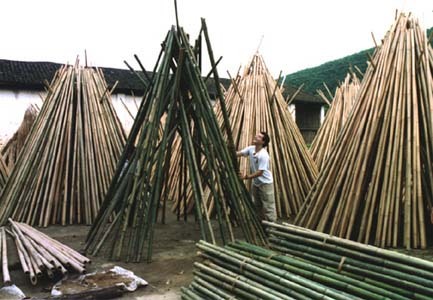 Green stalks lose their moisture and the sun changes them to the straw color that we find so familiar with bamboo rods. Once it is delivered it must have a check split run its entire length to avoid having multiple splits appear as it continues to age. As along as it is kept dry and free of mold it can be used for many years to come.